Palliative Care Service Development Officers (SDOs) provide an important role in managing and coordinating the development of Palliative Care Service Plans. Given the overviewing nature of their role the Service Development Officer is uniquely positioned to understand the needs of the catchment and the features of the palliative care service response. 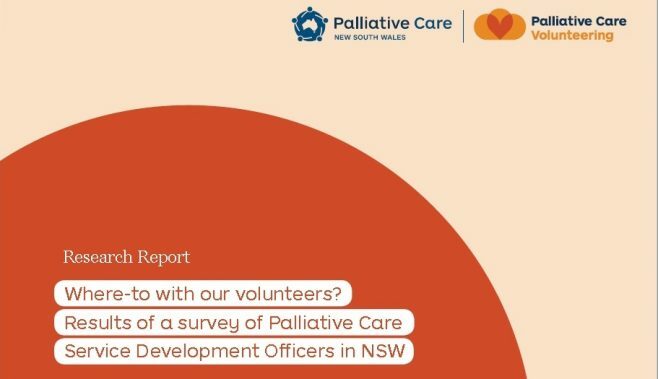 To gain an insight into the nature of management support for palliative care volunteers we surveyed 16 SDOs (15 within Local Health Districts, and in one Statewide Network) about their palliative care volunteers and how they envisaged the future of their volunteer program. Their comments and reflections were de-identified and aggregated thematically in the report. The survey also considered the information on volunteers as published by the services. Julie Flood and Alex Huntir are part of the Volunteer Support Services Programme at Palliative Care NSW. Read their 2016 report here.